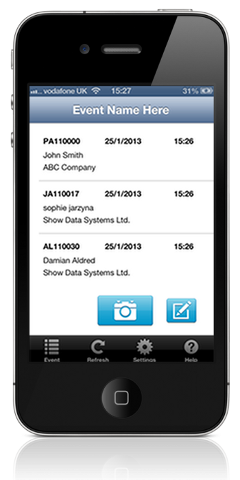 Hire one of our bar code readers. Data is stored in the memory of the scanner until downloaded, usually at the visitor registration area. Data is provided in CSV (Excel, OpenOffice, etc.) format either when downloaded on a USB stick or emailed the next working day after the event (subject to availability of data). Qualify leads with a bar-coded menu sheet - For instance 'send brochure', 'needs follow up visit', 'interested in product A', etc. Download our app to use on iOS devices. iPads are available to hire. Use on any device connected to the Internet with a web browser. Data accessible to download in whilst you are at the event through an online account and export in CSV (Excel, OpenOffice, etc.) format. This service connects visitors to exhibitors and complements our lead recording service. 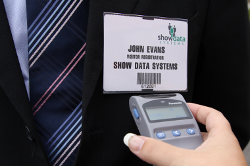 Exhibitors use their profile on our system to create and print QR codes for their company and/or products. QR codes can be displayed on stands or in literature. The visitor downloads and installs our mobile app on their smart phone/tablet and creates a free account. They scan the exhibitors QR codes to create their own list of exhibitor contacts and/or products online. 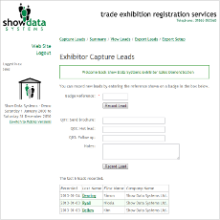 At the same time the visitor is recorded as a lead for the exhibitor.